If you are like me, a lover of bright-colored tasty foods that crunch, this Beet Walnut Pesto with Parmesan Bagel Chips (gluten-free) offers the perfect blend of flavors and snack-worthy crunch. Besides the absolutely delicious combination of basil, beets, and walnuts, the ingredients offer "jump for joy" health benefits. Short of licking the food processor's blades, my husband and I devoured an entire batch of this pesto in one sitting. Yes - it is THAT tasty! According to studies at Purdue University, basil contains high levels of antioxidants along with anti-inflammatory and anti-aging properties, helping us reduce inflammatory diseases and risks of cancer. Basil may also lessen the progression of asthma, osteoarthritis, and rheumatoid arthritis. These are some extraordinary reasons to eat more basil! High in antioxidants, vitamins and minerals, the red beet contains a unique source of the phytonutrient, betalain which contributes to detoxifying the liver and protecting the body from oxidative stress that often leads to aging and disease. The red beet also improves cardiovascular function and increases athletic performance. High-fives for beets! These delicious nutrient-dense nuts are high in plant based Omega-3 fats which improve cardiovascular function. Walnuts may also help balance weight control and improve brain function. If you don't have a nut allergy, go "nuts" for walnuts! This pesto is perfect atop gluten-free bagel chips or crackers, or use this pesto as the sauce for your favorite pasta. Beet pesto with edamame noodles is an absolute delight! 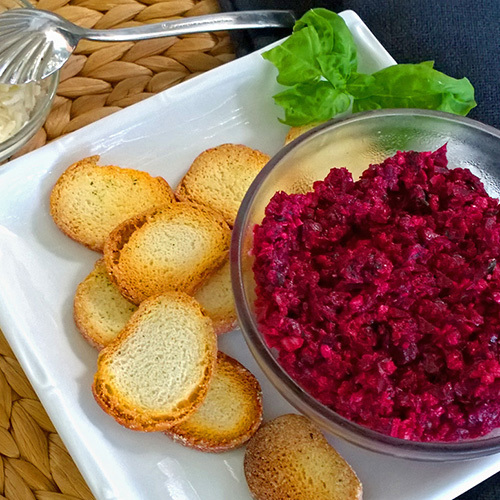 Have you tried beet pesto? We would love to hear your thoughts. *For a vegan option, use Bragg's Nutritional Yeast in place of cheese. Nutritional yeast is high in vitamins, especially Vitamins B6 and B12! Pressed for time? Use LoveBeets or other organic pre-cooked packaged beets (non-marinated). To cook beets: Gently wash beetroots, wrap in aluminum foil, and cook for about 30-35 minutes at 350 degrees. Beet cooking time varies on beet size. Beet skins are edible but if you prefer to peel the beetroots, wear gloves to avoid pink fingers or gently rub off skins under cool water. *There is a variety of gluten-free crackers and chips available in grocery stores or online. I love gluten-free rice crackers or almond Nut-Thins by Blue Diamond. For this recipe, I used Glutino Gluten-free Bagel Chips. 1. Pulse all ingredients in food processor starting with beets, walnuts, garlic, and basil. Slowly drizzle in olive oil and other ingredients until fully blended. 2. Top gluten-free bagel chips* (found at local grocery store), crackers, or toasted French bread with tsp or more of beet pesto. 3. Garnish with more grated Parmesan, chopped walnuts, or chopped basil. Pine nuts rather than walnuts also work well.